There is a miracle behind every single bag crafted in Italy – the miracle of Made in Italy. Ask any lady around the globe to choose between a bag made in Italy and the other one made anywhere else, she would definitely choose the first one. Let’s not take into consideration luxury giants because famous brand power is another aspect. In most of the cases the choice forward made in Italy piece is a subconscious one, but we decided to look into this magic and see ourselves how Italian artisans handcraft bags. We went to the factory of d’Este, an Italian brand of bags that carries the name of the oldest noble families in Italy and the symbol of royalty – the crown logo. In the production situated in the North of Italy, d’Este follows long Italian traditions of artigianato or artisanship. The bags are handmade using traditional methods of craftsmanship and expensive equipment, so each time the result depends exclusively on the artisan’s skills. Artisanship means no mass production, and the bags acquire the exclusivity value. To make just one d’Este bag an artisan works at least 8 hours. As for the leather, the brand’s founder and designer Andrea Dominoni chooses himself top level quality leather. Following all the stages of the production, his favorite one is to see a finished bag, of course. Artisans making d’Este bags are true professionals that have been crafting bags and leather accessories for 50 years already including many well-known luxury brands. To tell the truth, artisans are worth their weight in gold nowadays. They gain unique experience across the generations, and there are no schools to learn their trade. Moreover, one should be efficient, skilled and love what he does. Italian craftsmen own these qualities genetically. We are absolutely sure about this fact watching d’Este artisans working during the day. Everyone was so passionate explaining every detail that you can feel – these bags are made with love. Beautiful bag is a combination of design and quality. 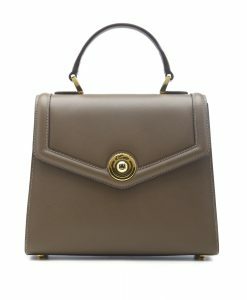 d’Este founder Andrea Dominoni says, details matter, as for example, engraving d’Este logo and crown symbol on all hardware details of the bag and covering it with 24-carat gold. Have you ever thought how difficult it is to sew a bag? It is not a machine that automatically stitches the bag, it is an artisan that does it manually with a stitching leather machine! Precise stitches result from the artisan’s skills and experience. Next time check your bag – if the stitches are absolutely straight and perfect, it was made by a machine as millions of other bags that have no value. The key word for d’Este bags is elegance. Inspiration arrives from Côte d’Azur style in the 1950’s, 60’s. The famous resort has been long attracting artists, aristocrats and movie stars from all over the world. This inspired the bags names – Monaco and Saint-Tropez. Andrea has always been fascinated with the elegant style of that time which, as impeccable quality, is always in fashion. Recently he has introduced a shopper bag Paris, and new shapes are soon to come. Once you take in hand one of d’Este bags you feel magic – they are beautiful, impeccable, realized in rarest colors of supreme leather. But the most important thing is that they are handcrafted in Italy with love, which make them unique and valuable. And the last thing – these bags have a long life, much longer than most of their competitors. Don’t miss the chance to feel this magic. This entry was posted in Fashion, STYLE and tagged bags, d'este, made in Italy bags, monaco bags.